Wow we had such a great night yesterday! You came from all over Holland to join this very special paddle by night. Due to the amount of people we got a limited permit and were only allowed to paddle the Amstel river. But still this was great fun and next to the Light Festival objects along the route we got to see lot's of Christmas lights, decoration and actually felt like being part of the Light Festival wearing our headlights and lights on board. We always love sharing the love for paddle boarding and our beautiful city that actually looks even more beautiful by night! We are just back from the best week ever at Bonaire. A week filled with yoga at the Windhoek pooldeck, paddle boarding trips at the Mangrove, sunset sessions, wake boarding, snorkelling and lot's and lot's of laughter. Even though there was a lack of wind and kiteboarding was only on for one morning we had a great time and enjoyed every moment of the sunny week! As we all like to escape winter and spend some time in the sun while having fun we are organising another sup - yoga - kite week at Bonaire in January again. More info is on our news page. Don't hesitate to contact us for any questions! e hope to welcome you at the sunny island of Bonaire and share the beauty with you on paddle board, kiteboard or during a yoga session on the beach! Last weekend Jessie Benson, founder FloYoFit came over to Amsterdam and thought these sup and yoga ladies a week of FloYo Fit and got them their certification! FloYo Fit is a sup yoga training and also has some fitness elements in the class which means it's not just 'Om' and does some serieus muscle work. Well done ladies. We have got another group of certified sup yoga teachers. See you all in 2017! We will for sure add these classes on our schedule next to the regular sup & yoga classes at Blijburg and our new spot in Amsterdam! As season is almost over, last classes Wednesday 28th September, we are selling all our schoolboards. So for all of you looking for a good deal an a second hand board. You are at the right address! 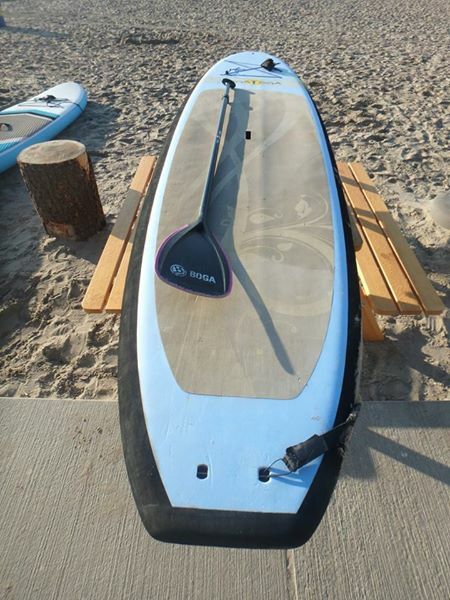 The BOGA YOGA soft top is a great board for yoga and also works good for cruising and as the material is durable the whole family can have fun on this board. The BOGA YOGA inflatable board is a great board for everyone who travels a lot and/or doesn't have storage for a 11 foot tall board. The board comes with a back pack on wheels, fin, pump and 3 pcs paddle. This is a great stable board that works well in the chop and waves. Comes with three fins and looks for a new owner who loves to cruise and hit the waves every now and then! 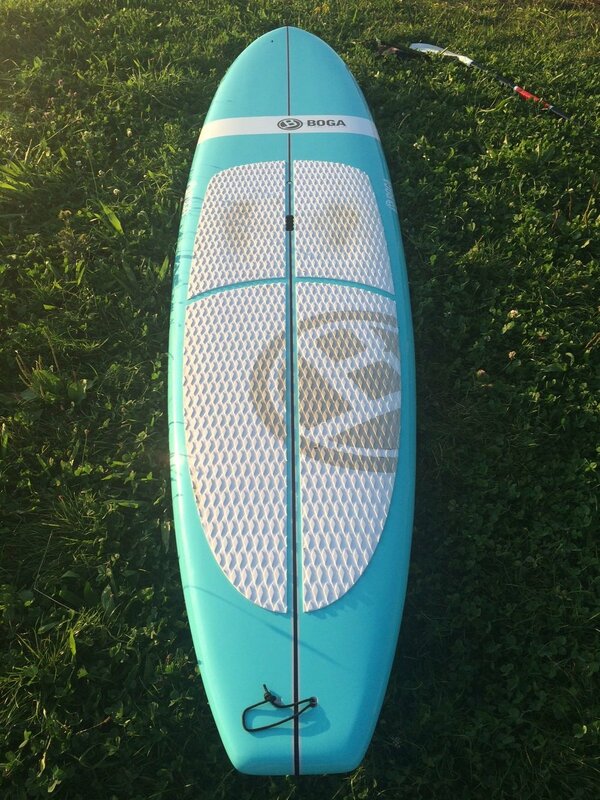 A demo BOGA 11'2 classic including lightweight adjustable paddle. This board works great for touring around and paddling longer distances. Hardly used and looking for a new owner! Great allround board with super stability so everyone can paddle it and even do some yoga as the decks is big enough for grip. If you are interested in one of these boards let us know per email morene@mm-sup.com There are available from the 26th of September. Even if season almost comes to an end we are always working on new ideas and getting ready for season 2017! Next year we will open a second location in Amsterdam at the newest hotspot Amstel Boathouse right at the Amstel river that leads into town. Last week we already did some exploring around and found some great quit sup yoga area's and also a couple of fun routes we can do tours. And finally we are able to offer the Friday Night Amsterdam tours again! We will also stay at beach Blijburg and there we will ad a couple of weekly beach yoga classes next to our sup and sup yoga classes. Summer came late this season and for which makes it feels strange that season is really coming to and end in two weeks. We are selling all our schoolboards: BOGA YOGA soft top incl paddle €550, BOGA YOGA i-sup incl 3 pcs paddel €850, NSP Coco 10.6 €750, NSP Element 11' €650 and an NSP I-sup 11' incl 3 pcs paddle €650,- Come join one of our last sup and - or sup yoga classes and check out these boards. We were so super lucky with the sunny weather yesterday at out first SUP & HAP trial tour. With a little group of 10 people we took off at the Secret Chef houseboat at the Eastside of Amsterdam and paddle for about 1.5 hrs before we got back and hit the delicious bites and bubbly wines. The next SUP & HAP will be announced soon and we might organize it on a different 'surprise' location every time. Love to meet you again. Sometimes it is super fun to go paddle on a different and new location. We have paddles the Amsterdam canals many times by now and even these canals get the same after a while. SURF LIFE camp owner Harry Glotzbach is a dear friend and BOGA teamrider and lives right at the Amsterdam Forest where he took me for a paddle last month. While paddling the idea popped up to organize a up tour in this beautiful forest in Amsterdam. We had some rain, we had some cloudy, we had a bit of wind... But who cares... It was one of the most impressing paddles ever in Amsterdam. Afterwards we had some drinks and bites (thanks every one for taking some) and Harry and his girl played some songs so it did actually feel like an after paddle summer picknick! Felt like we were in a fairy tales forest trees hanging over our heads and silence filled with rain drops and birds singing. Amsterdam Forest we'll be back! As we have more and more paddlers at an advanced level and up for some serious training we took out the Follow Up course and changed that into a weekly SUP training. Until the end of season Monday nights 20.00-21.00 are for the SUP fanatics. This training is meant for those who know the technique, can speed up, are not afraid for wind and chop and don't mond getting wet and sweaty. During these trainings we will focus on speed, beach starts, drafting, heart rate and advanced stroke and turns. Super fun to attend and a much better workout then in the gym. If you have your own board attend these sessions with your own paddle board if not we have boards you can use. A couple of weeks ago Ryan Salm from www.ryansalmphotography.com send us an email asking if it was possible to do a fun shoot of paddlers in the Amsterdam canals. Off course! We agreed that a super early morning paddle will be fun as Amsterdam wakes up we will be paddle through the waking up city. The bad thing is that when we meet weather is real bad, rain is pouring and it is cold but... we had a great morning paddle and fun with Ryan and his 'home made' raincoat :) Thanks and we look forward to the pictures we took at the famous Seven Bridges. After weeks of wind we couldn't be happier yesterday morning when we started the first Lululemon sup yoga class led by teacher Deborah Hoeks. Sunshine, calm waters and an empty beach. We couldn't have been luckier. After the positive replies from last years 3 week sup[ & yoga series we are happy to announce the first 3 week sup & yoga series start June 21st (28th and 5th July) at 19.30-21.00. 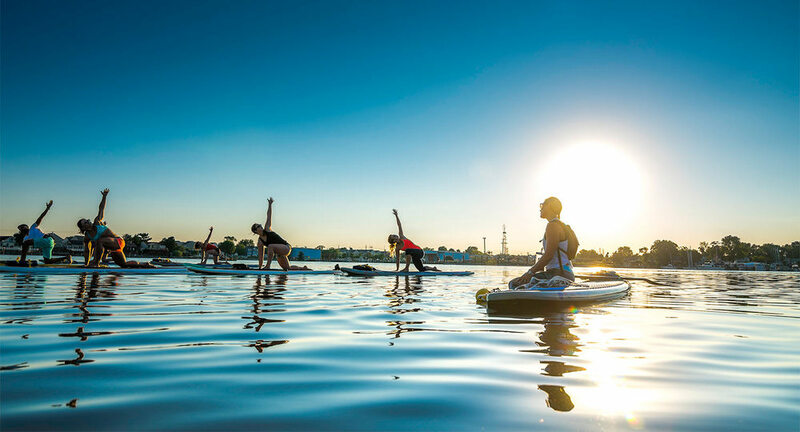 These series require no sup and/or yoga experience and are set up in a way that everyone attending will have a great time and lot's of fun while working on core stability and getting to know yoga on a paddleboard. We started this three week series as it works well to work in a group with people for a longer time then just one class. We are super happy with our newest instructor Brittanie. She just moved to Amsterdam with her husband and missed teaching sup yoga. Brittanie used to teach sup yoga at home in Houston and can't wait to step on board and start teaching again. Britannie hasher 200-hour registered yoga and is a registered SUP yoga instructor. In Houston she co-led SUP retreats and helped coordinate the volunteer and assisting program for the first SUP Program in Houston. Come join one of the sup yoga classes at Wednesday 19.30-20.30 or Sunday mornings 11.30-12.30 we will also start with the three week sup yoga series again in June. Last week Amsterdam was filled up with all kinds of Urban Sports throughout the city and M&M SUP filled up the waterpart. We organized a fun Friday Night paddle with a couple of friends and paddlers we have known for some time and Sunday we offered free clinics at the venue. The perfect way to show Amsterdam is a great city for all kinds of urban sports by using what the city offers, for free running, wakeboarding, skateboarding and stand up paddling is also one of the best activities as we have so many canals we can use freely and enjoy and explore the city in a different way. Also interested in exploring the canals on a paddle board? We offer some tours, for a canal tour we do ask some stand up paddle experience or recommend to attend at least two classes., The Amsterdam canals can be very busy with boats and water traffic which means you need to be able to steer, stop, turn and be able to control yourself on the board. As there are so many sup schools, rental locations and sup locations opening in the Netherlands at the moment it is about time we start adding some quality to them and connect. M&M SUP is part of the SUPCLUB Netherlands group. About seven connected sup schools are combining their strength and know how in this group. All these schools are working with certified teachers (ASI, HSA, WSA etc) to make sure they know how to teach and work according to safety standards. We are also collaborating and all have our own area';s we work in, as we these schools are located throughout the whole of Holland and we has a school in every area. In the near future more schools will be added to this great initiative that will guarantee quality and offers a wide range of sup classes, sup courses, sup tours and sup events locally or together. One of the first collars is the SUP & YOGA weekend in Eindhoven organized by M&M SUP (Amsterdam) SUPCLUB Eindhoven and PURA SUP (Roermond) the 9th and 10th of July. We believe that working together makes us stronger and offers much more for us and for you. A couple of weeks ago the famous German vlogster Linderella called us as she wanted to try out some sup & yoga really bad for her blog with us. As weather was really bad and chilly that time we had our doubts but she had planned her Amsterdam trip already so, fingers crossed. All our sun dances where heard and the morning Linda came for her class with the crew the clouds opened up and the sun welcomed us! Linda had a great time, even though she struggled a bit with the cold weather and water... So happy that we could offer her one of our brand new Zhik wetsuits that kept her warm and also thanks to reacher Ambre van de Berg by keeping her warm with some challenging poses.